This post will be continually updated as events warrant. The march today is to be held at 4 pm, which is in 90 minutes from now. There is news that the march has been postponed due to not being able to obtain official permission, but another piece of news here says Mousavi's going so that means it's on. = "Hearsay from a reliable source: Mousavi and Khatami are participating in the march". The Guardian has a great writeup on Ahmadinejad here. Wow - now there are reports that Khamenei has ordered a probe into the election to investigate allegations of vote-rigging. Turns out Mousavi had met with him last night. That's a pretty huge turnaround; remember he had already endorsed the results twice before doing this. Karbaschi (Karroubi's campaign manager and former mayor of Tehran) says the march will happen at 4 and calls for it to be calm and non-violent. Karroubi will be there. Pictures of the aftermath from last night at Tehran University have been uploaded here. It's 4 pm in Tehran now and people on Twitter are saying that the march has started with tens of thousands in the streets. BBC Persian is talking about something else but it's at the end of the hour so we'll see what happens in a minute or two. This tweet in Persian is telling people to write President-elect Mousavi (رئیس جمهور منتخب) from now on instead of just Mousavi. Translation: "Please remember to call Mousavi the president-elect of Iran; from now on I will be using this title, the president-elect of the people"
Here are three Twitter accounts to keep an eye on at the moment: Persiankiwi, Jim Sciutto, Change for Iran. Lots of people are writing that Mousavi is there; looking for a picture. This tweet in Persian says that Mousavi, Khatami, Karbaschi and Karroubi are walking in Enghelab Square. I'll add that map again so everyone can see where the march is taking place. Enghelab Square is on the right side, Azadi Square is on the left, and the distance between the two is 5 km. Apparently the demonstration is being attended by anywhere from tens of thousands to over a million (some are saying 3 million), but BBC Persian is just talking to people on the phone and no impressive birds-eye videos just yet. Twitter will tell us first if something happens, of course. Many are saying that the demonstration is very quiet because technically they don't have permission for a political demonstration so no political slogans are being chanted. Okay, here come the pictures. This tweet in Persian says that "From now on, instead of Mir-Hossein Mousavi we are using "President-elect Mousavi". The guy in the middle there is (former president) Khatami's brother. Oh good. I was hoping Nate Silver would do this - fivethirtyeight.com now has a more detailed look at the election results in Iran. This tweet in Persian says that no police whatsoever can be seen, just a helicopter. All right, this looks like the first embeddable video. And here's one with better image quality (and commentary; it's a news piece). ...or maybe this one is better. 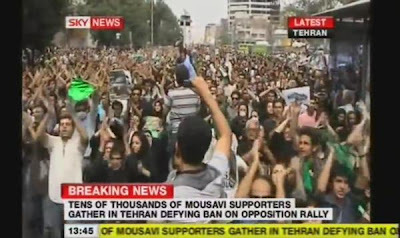 It's Mousavi in the middle of all his supporters. And a video from BBC Persian coverage almost an hour ago. And another video here with somewhat grainy but awesome coverage for 8+ minutes. This one probably gives you the best idea of what it's like to be there. Okay, BBC gets the award for the most WTF title of the day. Think of how you'd title this event if the task was given to you. "Mousavi joins throng of supporters"? 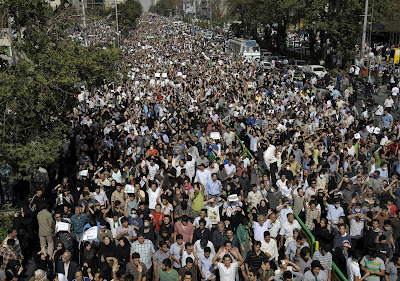 "Hundreds of thousands turn out to support Mousavi"? 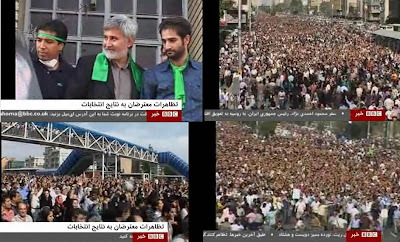 Or how about just "Supporters rally for Iranian presidential candidate"? Nope! 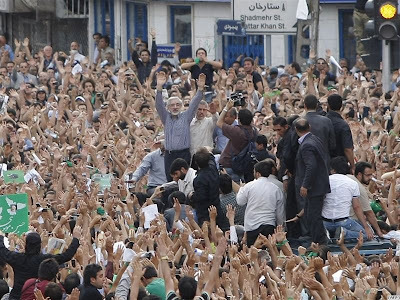 The title chosen is "Poll loser Mousavi at Iran rally". Okay, it's past 3 am here in Korea so that'll be all for today's updates. Here's the last picture; click on it to magnify it to its full size. Ahmadinejad has compared Mussavi's supporters with football/soccer fans disappointed after a lost match... You should republish the photo (from the post "Iran before the Revolution") of Ahmadinejad in his football team, so that the insurgents may use it as a sticker ! 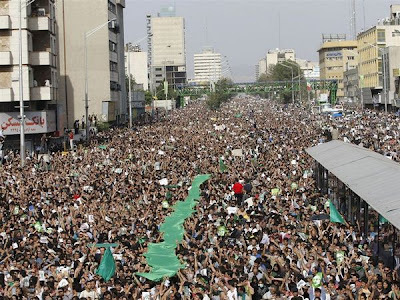 Where is the Ahmadinejad counter-rally? Shouldn't it be twice as big? If he really won, especially by that great a margin, wouldn't you suspect someone would be trying to organize one? Excellent coverage, really enjoyable to read and follow. CNN mentioned today that many Iranians are saying they do not know what to believe. It would seem this is the case internationally also. What we do know is that the truth can only be had through a re-election or a recount. However, that may not be possible since it has been claimed that many ballots are untraceable and the Government may refuse to conceed calling another election by saying they are refusing to bow to the violence of the opposition. No problem, I think bloggers have a duty to cover a story with developments as quick as this one. The poll itself is okay but it's very old, as it was conducted even before the candidates had been made official (that was on the 20th, the last day of the poll), and didn't reflect any of the events that happened in between then and June 12 - the coalescing of reformist support and the debates in particular.